Brave Children 5K is a chip timed race on smooth trails in beautiful Riverbend Park. Awards. Music. Food. Start and Finish on Picnic Island, less than a mile from the park entrance. Ample parking next to the race area. New this year: Virtual Run. Out of town? You can still participate as a virtual runner. Sign up, and we will mail you a shirt, a certificate and a bib. You can support Brave Children and run/walk anywhere you like. Doing Boston Marathon? Wear the bib and dedicate 3 miles to Sophiella and brave children who are affected by pediatric cancer. 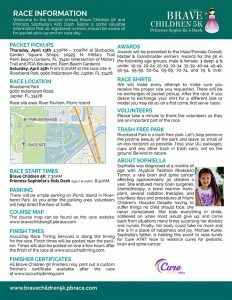 This race benefits Cure ATRT Now. 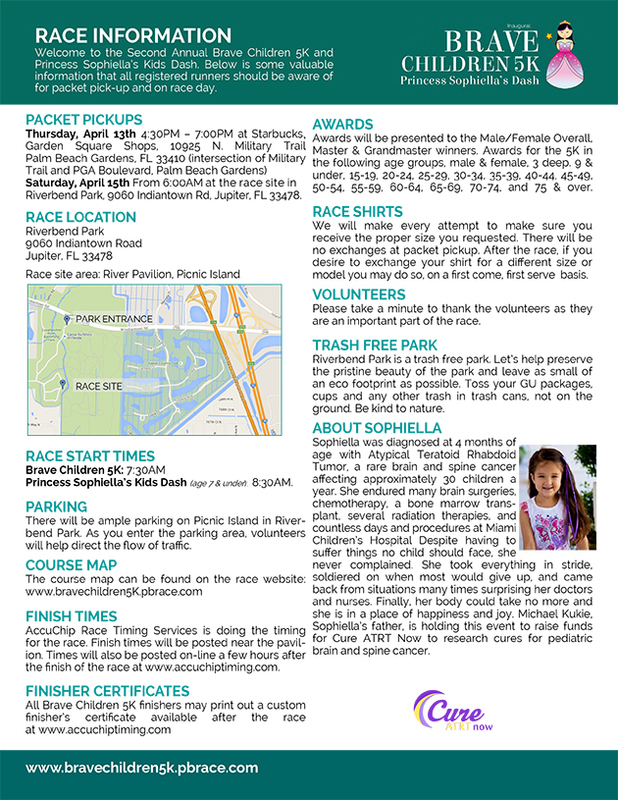 Saturday, April 21st From 6:00AM at the race site in Riverbend Park, 9060 Indiantown Rd, Jupiter, FL 33478. Start (heading north) on Picnic Island Loop Road, approximately .1 mile north of pavilion. Cross the bridge by Chillingworth Cabin and take left onto Riverbend Trail. Stay on Riverbend Trail past the bridge on the left and go over the multi-use/equestrian bridge. Make a left at the intersection onto Reese Trail. Stay on Reese Trail until the intersection of Reese Trail, Farmstead Loop Trail and Military Loop Trail. Make a left on to Military Loop Trail. Stay left at the first turn. Make the next right onto Big Grove Trail. Make a left onto River Walk Trail. Stay right until Riverbend Trail. 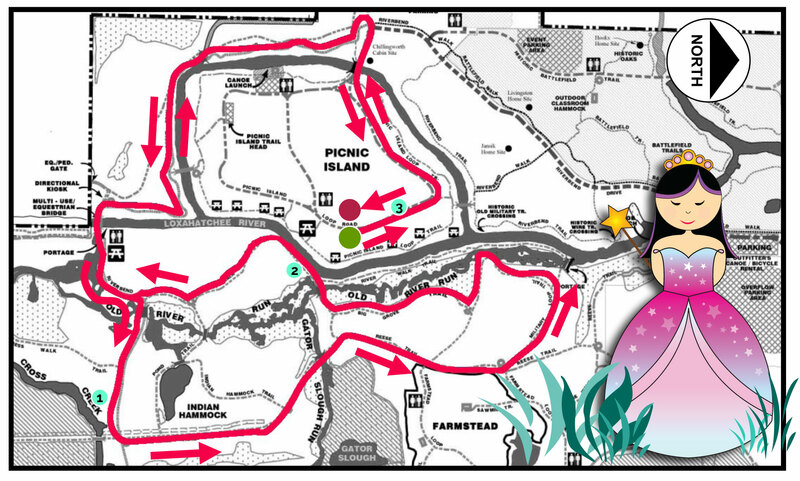 Make a right onto Riverbend Trail and backtrack to the finish line on Picnic Island. There will be ample parking on Picnic Island in Riverbend Park. As you enter the parking area, volunteers will help direct the flow of traffic. AccuChip Race Timing Services is doing the timing for the race. Finish times will be posted near the pavilion. Times will also be posted on-line a few hours after the finish of the race at www.accuchiptiming.com. Awards will be presented to the Male/Female Overall, Master & Grandmaster winners. Awards for the 5K in the following age groups, male & female, 3 deep. 9 & under, 15-19, 20-24, 25-29, 30-34, 35-39, 40-44, 45-49, 50-54, 55-59, 60-64, 65-69, 70-74, and 75 & over. Riverbend Park is a trash free park. Let’s help preserve the pristine beauty of the park and leave as small of an eco footprint as possible. Toss your GU packages, cups and any other trash in trash cans, not on the ground. Be kind to nature. Our mission is to provide hope to childhood cancer families who are battling AT/RT. We do this by funding research for better treatments & ultimately a cure for AT/RT. 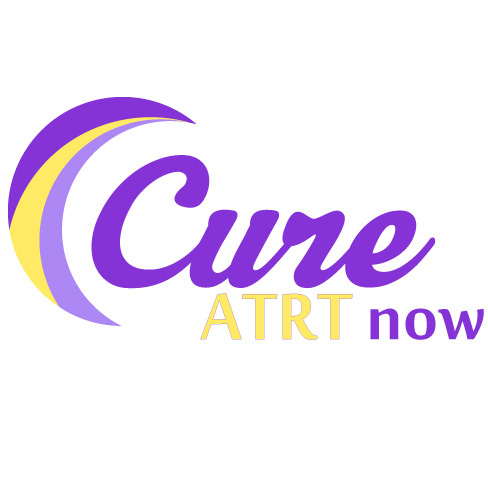 Cure ATRT Now provides grants for clinical trials & innovative research. Our focus is to identify & support visionary doctors & researchers, helping them to discover & apply new ideas & techniques to conquer pediatric brain cancer. Over 90 percent of all funds raised go directly to researching a cure for pediatric brain cancer. The other 10 percent goes to putting a smile on the faces of sick children. Through our Patient Support Program, we offer support & offer a little slice of happiness through our LIVE, LAUGH, LOVE, (LLL) Vacation program, our “FroYo / Cupcake Makes Me Happy” program & chartered Princess/ Pirate cruise programs. A fun costume kids dash! 5K chip timing by AccuChip. Run/walk a scenic 5K (3.1 mile) course on trails surrounded by beautiful nature. Age group awards. More information to follow.